Man's first bracelet was probably a simple vine or grass that was tied around the wrist. This then became leather (from animal hides), and when metals were discovered they became the material of choice. The earliest examples date back to 2500 BC - to the Sumerians in Mesopotamia, now Iraq. 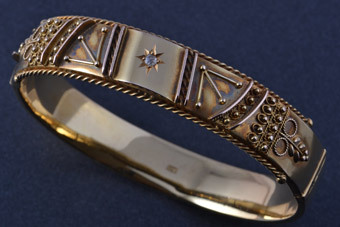 Women would wear bracelets and other accessories to show off their husband's wealth, and often the affluent were buried with all of their fine jewellery. The Ancient Egyptians are synonymous with jewellery - they wore it both as a form of decoration, as well as for mystical reasons. Their bracelets were crafted from gold and silver, and because of their love for pretty gems, they would adorn their accessories with stones like lapis lazuli, carnelian and turquoise. 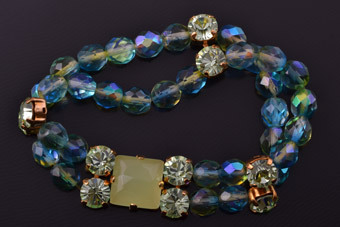 Some gemstones were chosen to bring good health, and some to protect from evil. 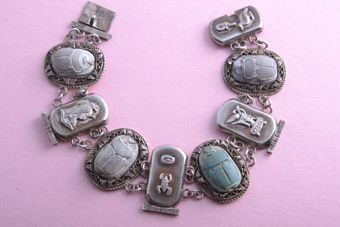 The symbol of the scarab beetle was considered to be good luck and it was therefore used extensively on all forms of jewellery. Ancient Greeks wore bracelets on their upper and lower arms, while their soldiers wore highly decorated leather cuffs. The Romans had a liking for gold bangles, and these were created to wrap around the wrist like snakes. Around the same time in China, bangles were predominantly carved out of jade, although gold was also frequently used. Bracelets became a common accessory for European women during the 17th century, and they would often stack thin bracelets and ribbons on their arms. Queen Victoria loved jewellery and the one item that she made incredibly fashionable was the charm bracelet. Women would copy her choices in clothes and jewellery so they all had charm bracelets with charms that would tell the stories of their lives. Another type of bracelet that the Queen made popular was a hair bracelet, made from the hair of a loved one. 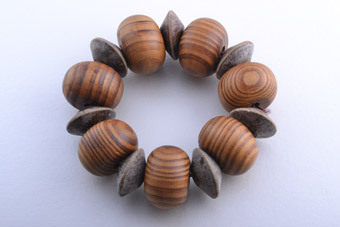 In more modern times, bracelets come in a huge range of sizes, materials and designs. They vary in price from relatively cheap to quite lavish and are worn by both men and women. While we've replaced vines with gold and shells with gemstones, bracelets continue to be one of the most loved and worn jewellery accessories.